Montreal, August 16, 2013 — In a series of general assemblies beginning August 20, Canada’s 7500 federal correctional officers will vote on whether to accept an agreement-in-principle to renew a labour contract that expired in May 2010. Ratification votes will conclude September 9. 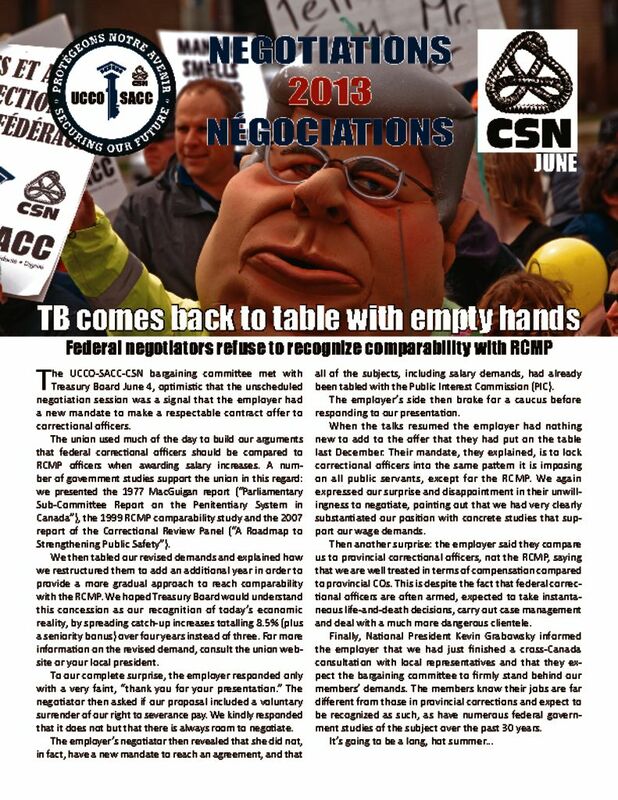 The tentative agreement between the Union of Canadian Correctional Officers (UCCO-SACC-CSN) and the Treasury Board of Canada was reached July 23, but federal negotiators requested an information embargo on its contents until today. Last spring, a parallel negotiating process with the Correctional Service of Canada (CSC) produced a tentative Global Agreement on operational matters, which members will also be asked to vote on. The agreement with Treasury Board would implement a 9.25% pay increase over a four-year contract, among other improvements to working conditions. UCCO-SACC-CSN National President Kevin Grabowsky hailed his members’ determination to resist federal government attempts to force them into a negotiating pattern that ignored the specific demands of their workplace. “For more than three years, we refused to be bullied and intimidated,” said Mr. Grabowsky. “We fought with facts, creative pressure tactics and, above all, with solidarity.” The union’s national executive is recommending that members vote to adopt the agreements. The deals include improvements to overtime and annual leave, and a system to fairly compensate statutory holidays in a workplace that operates 24 hours a day, seven days a week. As well, the tentative contract strengthens seniority rights, expands training programs and improves security practices for officers on outside escorts. While the union finally accepted Treasury Board’s main demand to eliminate severance pay on resignation or retirement, these funds will continue to accumulate until a new collective agreement is signed. In return, the union fought for and obtained an annual Correctional Officer Allowance of $1750, which represents a pay increase of approximately 2.5%. This provision allows compensation for correctional officers to stay in a range comparable to RCMP officers, a key union demand. “This was a tough negotiating round,” observed Kevin Grabowsky. “The federal government was using the current economic context to weaken working conditions and our ability to bargain collectively. As a union we can be very proud of the way we resisted these attacks. “However, we will already be back at the negotiating table next spring, and we hope we will find a more respectful attitude for the dangerous work our members perform to protect all Canadians at 52 federal penitentiaries.” For more information, Lyle Stewart, CSN communications service (514) 796-2066. UCCO-SACC-CSN members mark three years of working without a contract Montreal, May 31, 2013 — Federal correctional officers are holding information picket lines outside 52 Correctional Service of Canada (CSC) penitentiaries between 6 am and 7 am this morning to observe the third anniversary that they have worked without a valid collective agreement. The labour contract for the 7,500 members of the Union of Canadian Correctional Officers (UCCO-SACC-CSN) expired May 31, 2010. 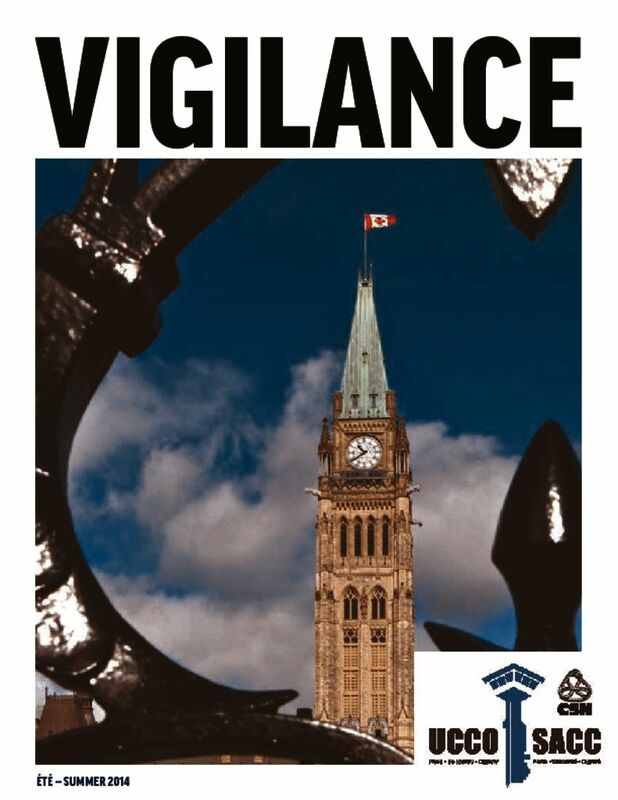 This morning’s actions express growing frustration among the membership with the refusal by Treasury Board of Canada negotiators to take into account the dangerous nature of their work in an increasingly violent correctional system. “In the last three years, we have seen much more conflict among inmates and attacks on staff,” said UCCO-SACC-CSN National President Kevin Grabowsky. “The federal government is failing to recognize the growing risks correctional officers take every day to keep Canadians safe.” UCCO-SACC-CSN is demanding the government continue to respect the principle enshrined in the last collective agreement, namely that remuneration for correctional officers be maintained within a range afforded comparable groups such as RCMP officers. The current Treasury Board offer would greatly widen this gap. The Conservative government also unilaterally clawed back a negotiated raise in the final year of the union’s last contract. In addition, the Treasury Board continues to demand that members surrender their right to severance pay. “Treasury Board President Tony Clement always says he fully supports the correctional officers who work at the two institutions in his riding and across the country,” noted Mr. Grabowsky. “Support has to be more than just talk. It is time for Mr. Clement to step up and give a real mandate to his negotiators.” After a series of crime bills, rapid expansion and then sudden cutbacks, the Correctional Service is a department under great strain, observed Mr. Grabowsky. He noted that public service employee surveys consistently show that CSC employees suffer the lowest morale and highest levels of stress in the federal government. “We are seeing pressure from government decisions at every turn: from needlessly closing three institutions, which is exacerbating a huge problem with double bunking, to cutting access to programs and other rehabilitation services,” he said. “All these decisions make our jobs much more difficult. We will continue to do our jobs protecting Canadians. We simply want the government to recognize the value of our dangerous work at the negotiating table.” Last December, Treasury Board requested conciliation. While the union is participating in this process, it believes direct negotiations are the best way to reach an agreement. After a union request, a face-to-face negotiating meeting is now set for next week with Treasury Board. 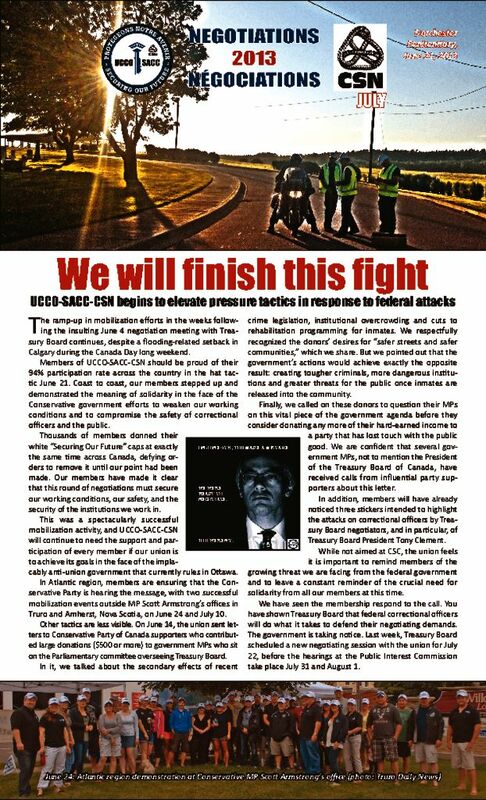 Since UCCO-SACC-CSN began negotiating with the Treasury Board of Canada to renew its collective agreement, time has passed us by. Our collective agreement expired 1,096 days ago On May 31, 2010, Kim Jong-il, Elizabeth Taylor, Jack Layton, Ted Kennedy, Steve Jobs, Hugo Chavez and Osama Bin Laden were all still alive. Japan’s Fukushima nuclear plant appeared to be a safe source of energy. Sendai still existed. Thirty-six months ago, Barack Obama was barely a year into his first term as President of the United States. Benedict was still Pope. People knew who Michael Ignatieff was. Before we started negotiating a new collective agreement with the federal government 156 weeks ago, Canada’s NDP had never formed the official opposition. Stephan Harper still led a minority government. Treasury Board President Tony Clement wasn’t known for spending millions of border security funds on a gazebo in his own riding. The Los Angeles Kings had never won the Stanley Cup. More than 1,096 days ago, only South African soccer fans could tell you what sound a vuvuzela made. British Petroleum was not known for its oil spill disaster in the Gulf of Mexico. Decades-long dictatorships ruled Tunisia, Libya and Egypt. Bashar al-Asaad was unchallenged in Syria. More than 26,304 hours ago, when we started to work for a fair and decent labour contract, we didn’t know we would end up bargaining for three years and still not have a deal. We hope another year won’t pass before that happens. The world is changing. At Treasury Board, unfortunately, it seems as if time stands still. Isn’t it time to finish what we started, before history passes us by? We deserve a good contract. Let’s finish the job.